While Donald Trump was on a MSNBC Hardball Townhall with Chris Matthews, made some extraordinary ejaculations about abortion. Pro-Lifers have been chary about Trump's recent conversion to being against abortion, especially as the Manhattan mogul had labeled himself as being "very pro-choice" in the past. Moreover, Trump continues to speak highly of Planned Parenthood's contributions to womens' health during Republican debates, even after the Center for Medical Progress' investigative videos implicating Planned Parenthood Clinics trafficking baby body parts for sale and altering abortions to get the most optimal harvest. Well, Mr. Trump may have overcompensated to ingratiate himself with pro-life Republican voters for the Wisconsin Primary. When Chris Matthews pressed Trump about the consequences of banning abortions, Trump proposed that women having abortions should suffer some sort of legal penalty for incurring an illegal abortion (but men would be alright). More than just wanting to punish women for having abortions, Trump seemed to acknowledge that women would still seek out illegal abortions in unmonitored clinics. The public reaction to Trump's "modest proposal" was a swift and stern firestorm. The Hillary 2016 and Sanders campaigns immediately jumped on Trump's bold bluster to condemn this ham handed handling of womens' issues. On social media, a Dominican Friar indignity opined that those who wish to punish women for having abortions have no idea about their psychological or moral pain he hears about in the confessional. The Trump campaign twice tried to walk their man from off the abortion ledge. At first, Trump spokesperson Hope Hicks tried to pawn decision making of penalties off to the states. But several hours after uttering this incredible idea, Trump took the counsel of his advisers and did an about face, walked back the punishing aborting mothers' idea to a more conventional Republican pro-life position of punishing the doctor and seeing the woman as a victim. CNN noted that Trump took three abortion positions in one afternoon. Former 2016 Presidential rival and now Trump surrogate Dr. Ben Carson explained away Trump's peculiar position on punishing abortion women. Carson claimed that Trump (like himself) is not a professional politician and that he had been ambushed with the question. Judging from the three positions in a span of hours, Trump either had not thought much about the issue or needed to have some political sense knocked into him for the primary face offs. This Trump gaffe created an opening for his Republican rival Senator Ted Cruz (R-TX) to issue a statement on the sanctity of human life and on affirming women. 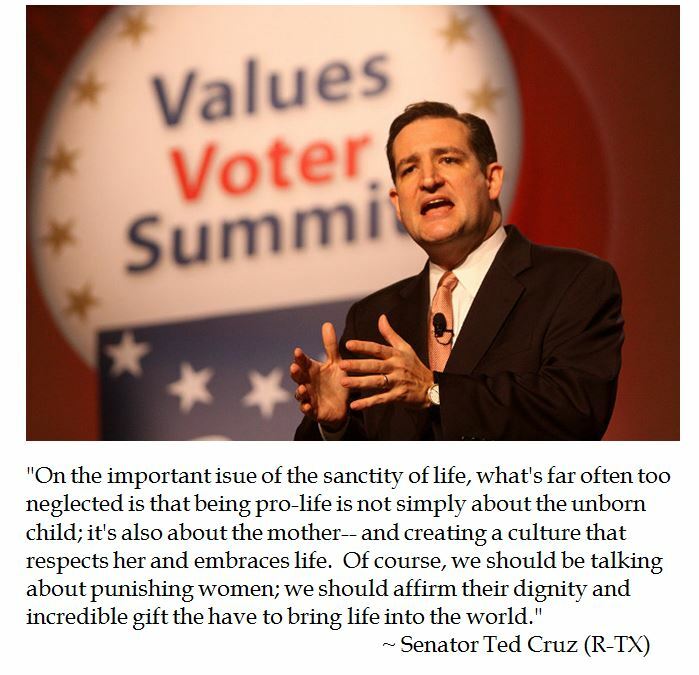 In addition, Cruz had a previously scheduled rally to honor women on the same day of the abortion kerfluffle. While Presidential candidates should not pick their positions on weighty moral issues on the weather vane of popular opinion, it is dubious if Trump's flip flops on abortion will help him with women voters. According to the recent Marquette Law poll, Trump's support from women lagged 11% behind men. Threatening to punish women for abortions will obviously alienate him with progressive voters who are pro-choice. However, flip flopping on anti-abortion views within hours of each other impeaches his newly formed pro-life positions too.